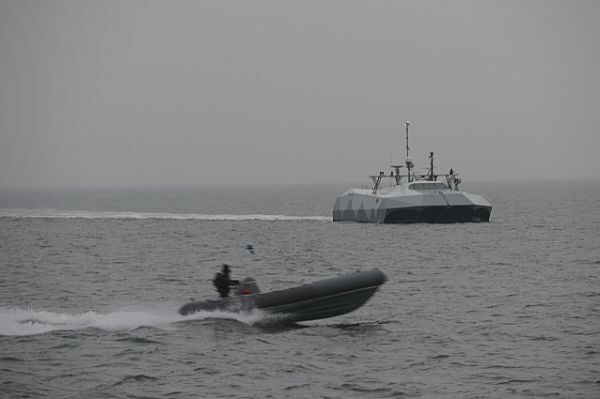 Well, there is this image from here of the M Ship Company's Stiletto "boat" doing stuff with the Navy. You might remember Stiletto from an earlier post of mine A real littoral combat ship goes to sea with an Army crew or perhaps the discussion of the hull form from Sunday Ship History: Hickman's Sea Sleds . 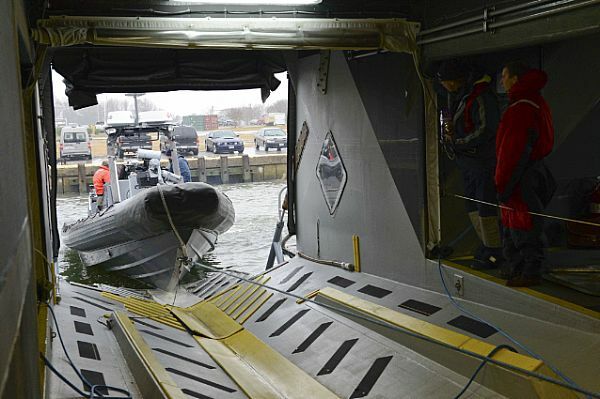 The Stiletto Maritime Demonstration Program kicked off its first Capability Demonstration with the Navy Expeditionary Combat Command (NECC) off the Virginia coast near Naval Amphibious Base Little Creek, Va. The demonstration provided NECC Sailors — and 15 industry partners — an opportunity to evaluate products in a realistic maritime environment. Probably won't get a photo of the UUV thing. Stiletto, a maritime demonstration platform, serves as a technology demonstration tool for industry, Government, and academic organizations. It provides an opportunity to learn and to improve systems as they function in an at-sea environment and raise a system’s Technology Readiness Level (TRL). 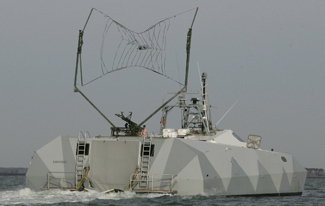 The Stiletto program’s physical infrastructure consists of the high speed Stiletto craft with a Command Information Center (CIC), Launch and Recovery (L&R) for an 11M Naval Special Warfare (NSW) Rigid Inflatable Boat (RIB), arch space for sensor installation, flight deck for Unmanned Aerial Vehicle (UAV) L&R, and electronic network infrastructure with wide band satellite communications (SATCOM), along with an 11M NSW RIB with unmanned capability. Both the craft and its systems were designed to be flexible, modular, and re-configurable to enable near “plug-and-play” installation. The Stiletto crew includes engineers and technicians with expertise in multiple maritime technology areas. The crew can provide engineering assistance to integrate systems aboard the craft and to help develop demonstration plans to achieve technical goals. Funny, they were trying to surplus it off a year or so ago. 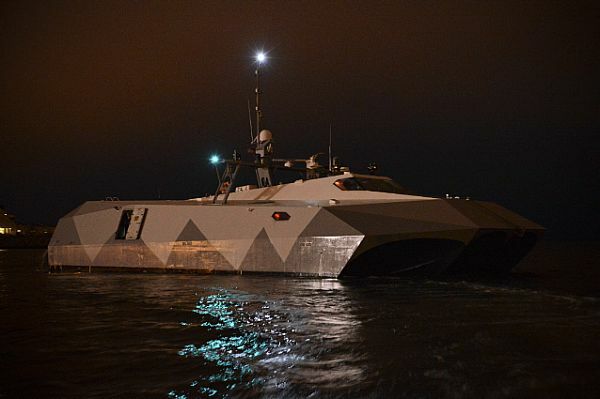 To clarify, the Navy isn't testing Stiletto the boat. It's being used as an available platform (because it isn't a Navy operational asset) for Department of Defense to test emerging technologies in a maritime environment. The program is currently looking for UAV / UAS technology candidates from private industry, academia, and Government R&D organizations to support an upcoming capability demonstration for United Kingdom Defense Science and Technology Laboratory. 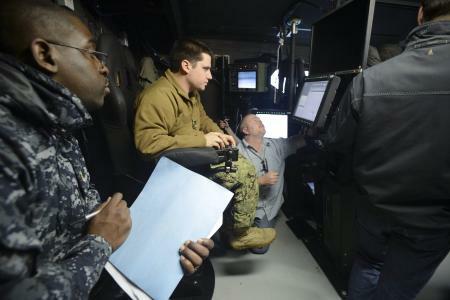 Again, DoD is using the Stiletto as place for others to test their new technologies. The application deadline to participate in the DSTL demo is Feb. 19, 2013. 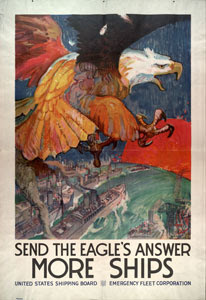 Information is available online at FedBizOps at https://www.fbo.gov/ and searching solicitation number N0016713RFI01; or emailing the program's operators at Stiletto@navy.mil. 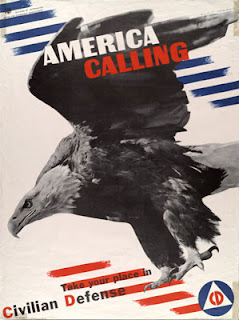 Move Over Iran, I've Got A Super Airplane, Too! Federal Budgeting: "The fiscal grand canyon"